The town of Banner Elk is the site of one of the most unusually themed festivals in the United States. Held each year since 1976 on the third weekend in October is the Woolly Worm Festival. Between Ski Beech and Sugar Mountain ski resorts, Banner Elk in October is quite literally one of the prettiest spots in the nation. Fall colors are ablaze, the skies are Carolina blue and the temperatures are not yet frigid. It is truly a gorgeous setting for a ridiculously fun event. The woolly worm is not actually a worm but rather the larval stage of the Isabella tiger moth or, more properly, Pyrrhactia Isabella. Of course, the Pyrrhactia Isabella Festival doesn't exactly roll off the tongue quite as well as the Woolly Worm Festival does, so the founders went with the latter. Regardless of the name, the festival has been a rollicking success for almost thirty years now. Each year, one thousand or so worms are hand picked by festival visitors to be entered in the races as they vie for the $1,000 first prize. Some folks find their own worms but they can also be purchased at the festival. The 'race tracks' are actually 20 vertically hung three foot pieces of string upon which the worms are placed. Then the fun begins. Nothing on earth can match the pace of a woolly worm race. For those not familiar with the mighty woolly worm, let's just say that a woolly worm makes a tree sloth look like a cheetah! The excitement of the event comes not from the pace of the 'race' but the enthusiasm of the contestants. Children and adults alike cheer on their entries as though they were at the Kentucky Derby but of course, these racers take quite a bit longer to cross the finish line. Winners are declared by Tommy Burleson the 7'4 NC State basketball legend and Avery County resident. After all, he's the only one tall enough to see over the gathered crowd and view the finish line at eye level. 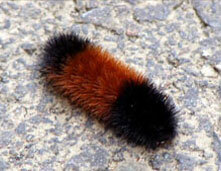 Local lore has it that the brown and black segments of the woolly worm can accurately predict the length and severity of the winter. For many years, former mayor and local legend, the late Charles Von Cannon was the official 'worm reader' of the winning worm. He brought his home spun mountain wit and wisdom to his predictions much to the delight of everyone involved. While the value of woolly worm prognostication has been scoffed at by so-called weather experts, it is said that Mayor Von Cannon's predictions were 90% accurate. Not bad at all. Upward of 25,000 people attend the festival each fall to enjoy the races and related activities. Dozens of crafters display their wares and food vendors sell an incredible array of tasty treats. Carnival rides, live music and even helicopter rides round out the activities of this two day event. A portion of the proceeds of the festival are used to benefit children's charities in Avery County and is sponsored by the Banner Elk Chamber of Commerce in conjunction with the Kiwanis Club. For more information, phone 828-898-5605.